The art that suits you (Kunst dye dich zyret) a nice project of Thore Wilkens and Uwe Fiedler @ the Schlossberg Museum of Chemnitz. It started with an academic conference in February 2016, where I gave a paper about Fight Books’ typology. I have good memories of this conference, which gathered academics, independent researchers (HEMA practitioners) and museum professionals. A year and a half later (August 2017), the exhibition opened for 4 months, with HEMA demonstrations. I could not attend and was there during the very last weekend (closing of the exhibition). I am really happy to have seen it, since it was the last piece missing for a forthcoming article about museum exhibitions including Fight Books over the last 25 years. Books and weapons were at the heart of it. A large amount of Fight Books were gathered, both manuscripts and prints. For the Fight Books affictionados, who do not have the opportunity to hold them in their hands while studying them in the libraries’ vaults and who usually look at them through a computer screen, it was one of the major benefit of the exhibition. Having them in a room under their glass cases allowed to realise how different the formats and sizes of those books are. One copy of Joachim Meyer 1570’s treatise bore interesting trace of reception. Small leather markers glued at the pages featuring illustrations proved that this copy was read in details and used with a self-made system of referencing and reading tools, probably by a martial artist. A steel dussack (1580, private collection). I often came across this idea that the weapons represented by the term dussack would “only” be fencing toys made of wood covered by leather to play with during fencing competitions (so-called fencing schools). Those fencing simulators, largely illustrated in the Fight Books, are standing for actual weapons, and this one is a very fine example. 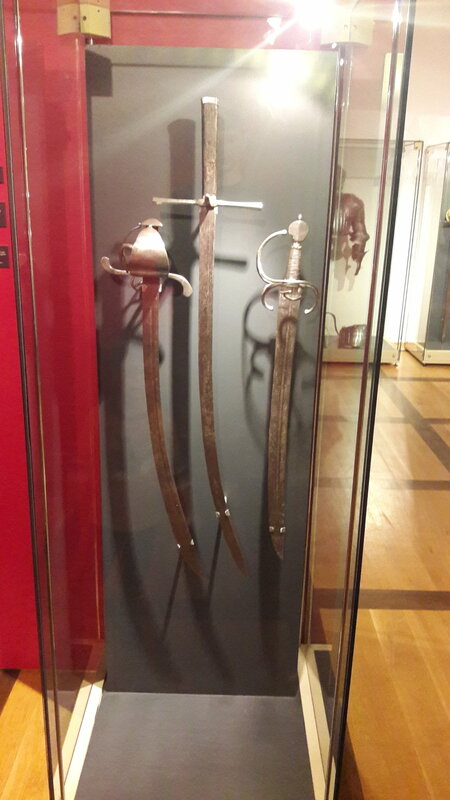 A couple of longswords with hand protection device (1550s), coming from the Rüstkammer of Dresden, famous for its collection of foot tournament objects in the 16th and 17th c. The hand protection is made of wood and leather, covered with silk and metal decorations. The blade bears the mark of the passing wolf of Passau (but maybe be a later addition). A nice alternative for a fencing sword! 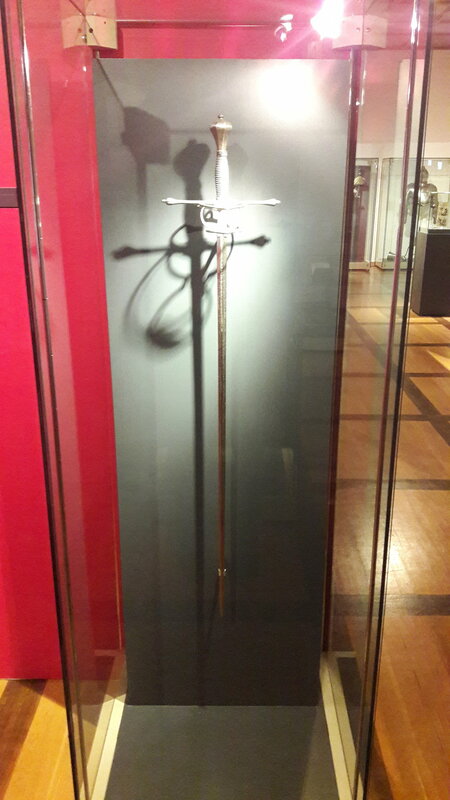 The exhibition was installed in three rooms, one being the introduction with a few texts and weapons, the large room with the books (see pictures) and a smaller last one with two screens displaying close-ups of the manuscripts and HEMA demonstrations. There were additional objects displayed, outlining either the chivalric culture of single combats (an armour, black and white reproductions of the Freydal) and the corporation of burghers and fencings school (a commemorative glass with fencing depictions and illustrations of fencing schools from 16th but mainly 17th c.). For those who missed the exhibition and were teased by this humble exhibition report, you can always have a look at the exhibition catalogue. A very nice book, hard cover, with selected papers from the conference and all the objects of the exhibition. It will be reviewed in the next issue of Acta Periodica Duellatorum (6/1, May 2018).